The MWPSB (Ministry of Welfare's Public Safety Bureau ) is called to investigate a incident involving an explosion at a busy shopping venue despite no casualties. So far, their main suspect is Akira Kitazawa due to his unstable Crime Coefficient and prior knowledge of demolitions. As a part of Division 1 Inspector Akane and her Enforcers are called in to track and arrest the suspect, who flees from the scene with a female hostage by car. 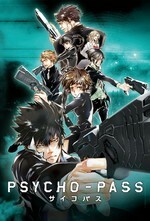 Psycho Pass S1 was well-received by anime and non-anime fans alike after it aired back in 2012-13. Although, the jury is still out whether the ending could have been the best possible or best suitable conclusion but the entire world/setting is interesting enough on it's own. Previously. In preparation for the Fall 2014 season there is a Psycho-Pass Extended Edition which recaps all the major events with some animation improvements and small details from the novel added in. It's not required to watch S1 and the Extended edition too as they cover the same ground but it's for newcomers who want to catch up with the story so far. The first episode of S1 starts in media-res and there is a little to no introduction of the old cast other than it's been some time since Akane Tsunemori has been working as a Inspector. This time the rookie is following her is Mika Shimotsuki, a JR Inspector, who made her first cameo appearance back in episode 6 during S1. A few of the Enforcers are new faces but we still see the old members including Nobuchika Ginoza, who had been demoted from Inspector since the last incident to Enforcer. It's a welcome change to see Akane efficiently take down out of control robots, lead her team to capture Kitazawa, but not risk any casualties along the way .Then after checking Kitazawa's crime co-efficient Akane finds out he's just on the borderline of being eliminated or not. She talks to him about his actions and asking for the real reason for the explosions which caused property damage but didn't harm anyone. Fortunately during this conversation, Kitazawa's crime co-efficient drops enough to switch to Paralyser mode for Akane and he's safely captured without any problems. Meanwhile, another Inspector Shisui and a Enforcer are still following the hostage who had separated from Kitazawa during his escape and fled on foot to a nearby park. Strangely enough she disappears under a bridge and a man appears and the two realize the original female hostage was in a fact a hologram all along. Despite pointing the Dominator at the new person there are no records or even information on his crime co-efficient or HUE on Shisui's monitor. During the initial confusion, he paralyzes her with some unknown substance, and forces her to kill the Enforcer Yamatoya. The episode concludes with a the bloody note "WC" left behind and Inspector Shishui's whereabouts are unknown. Finally done with the belated Fanfare posts and thanks for all your patience and feedback. I'm still relatively new to this so any comments or suggestions are welcome. The short summary is referenced from Wikipedia's episode listing for Psycho-Pass S2. P-P Season 2 is available for streaming at Funimation at 12:50 PM EST. Although, I tried to limit my personal observations/thoughts from the OP and instead I'll write any side notes here in the comments for related topics to P-P. Fair warning, as I'm not a expert on mental illnesses, Japan, or dystopias and it'll be all strictly from my own conjecture based on what we've seen so far from the episodes. BTW: I have not watched Psycho-Pass Extended Edition (also, it's been a while since I've seen S1) and some of info may be incorrect but I'll do my best to keep it up to date using the Psycho-Pass wiki/other translations. Without further ado, good luck and have fun with discussing Psycho-Pass S2 here and in future Fanfare posts. I realize it's been a while, but Nobuchika Ginoza seems to have filled his father's shoes pretty well, losing the glasses and the up-tight demeanor and finding comfort in the world. Then again, knowing you're already identified as a latent criminal but still having a place in society might be the release he needed to tone himself down. Mika Shimotsuki seems like the new old-Ginoza due to her need to follow protocol in all instances and leave the touchy-feely detective work in the past, plus some of the newbie cockiness of Akane without the humility. It's also interesting to see a larger cast, but a smaller focus on characters. In the first season, I felt like everyone in the main squad was a bit fleshed out pretty early on, while there are characters in the main group who are really one-dimensional and haven't even had many lines up into the 5th episode (where I am now). Maybe they'll get more focus in future episodes.